Metal spinning is a form of symmetrical metalworking where a flat circle, or circular, piece of metal is fitted into a hand lathe or CNC lathe. Held in place by a pressure pad, the metal disk is spun at an appropriate speed. A localized force utilizing a variety of rollers or tools is applied either by hand or by machine to gradually form the metal over a “chuck” or mandrel. In complex spinnings, multiple chucks may be used to accomplish a specific shape. Chucks are made from hardened metals or wood (see Special Considerations). Spindustries works with a wide variety of materials including aluminum, copper, brass, stainless steel, and mild steel. 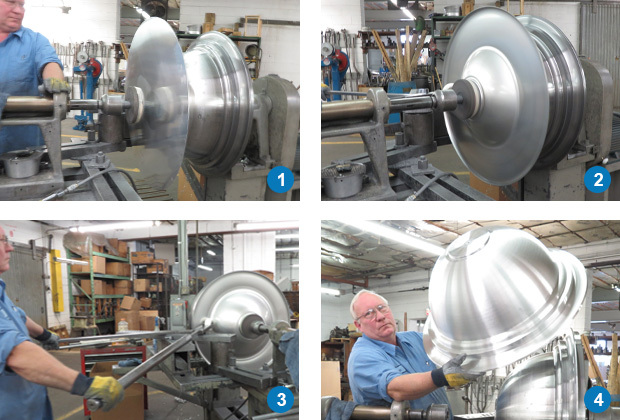 While some materials can be spun cold, others require annealing to be shaped effectively. Metal spinning has significant advantages over other forms of metalworking such as stamping, forging, or casting. Extensive value-added services including welding, polishing, powder coating, brushed or textured finishes, part washing or degreasing.